Our 3D Tropical Mist Combo is not your ordinary bounce house. Its 3D trees make it a one of a kind stand out piece at any event. 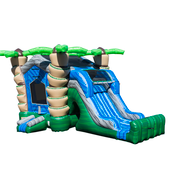 This unit can also be rented wet under the waterslides section.